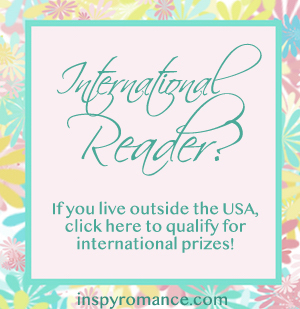 A Lifetime of Romance… Quiz and Giveaway! Did you ever wonder what happened to the hero and heroine of a romance novel after their happy ending at, say, age 25? Or with an older couple, did you ever wonder what experiences led to their getting together? 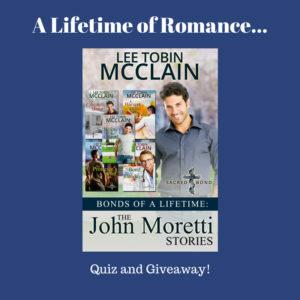 I have a great way for you to find out in at least one case: Bonds of a Lifetime: The John Moretti Stories. If you’ve read any of my Sacred Bond novels, you probably remember John Moretti. He’s the founder of the Covenant School, a Christian boarding school for young men on the brink of getting in bigger trouble or being incarcerated. He mentors the young men who grow up to be the heroes of the Sacred Bond novels, and he mentors Chad Sager, the mentor of the boys who grow up to be the heroes of the Sacred Bond Guardians. Along the way, he falls in love, makes mistakes, suffers losses, raises a daughter and nearly loses her, and finds love again. I’ve pulled together John’s story, published in bits and pieces over the past few years, into one collection of novellas. Whether or not you’ve already read the individual stories, I hope it’ll be as much fun for you as it has been for me to read them together and ponder what love and romance can mean, to one person, over a lifetime. Just for fun, I’ve put together a little matching game. Answer the questions below TODAY (guessing is fine!). I’ll post the correct answers at the end of the day, and I’ll draw a random winner who will be gifted any full-length Sacred Bond novel of her choice. In this story, John meets his son for the first time… at age eighteen. In this story, John’s daughter Maria is kidnapped during a Memorial Day celebration. This novella centers around John inheriting half a farm… but unfortunately (or fortunately) a woman he’d rather avoid inherits the other half! John ends up heartbroken on a motorcycle outside a church in which of the following stories? When the Christ Child is stolen from an old woman’s yard nativity scene, John must work with the woman’s attractive-but-distant granddaughter to solve the mystery and make Christmas complete. Answer the questions TODAY in a comment, like this: 2, 4, 5, 1, 3 (you can also add other comments if you like!). Remember, the quiz is just for fun, so guess away! I’ll draw a random winner tomorrow morning for a full-length Sacred Bond ebook of your choice (but not the novella collection I’m talking about above, which is for sale, and ON SALE, THIS WEEKEND ONLY, here). One more thing… have you joined my newsletter? If you have, you just received one that told you about your free novella, A Bond of the Heart. If not… sign up here and grab your free novella! Hi Lee! Delightful post. The only book I have read in the boxed set was A Harvest Bond. As a retiree, I enjoyed that the hero and heroine are senior citizens. I loved the conflict in that novella. Nice idea to bring the story together in a boxed set. Best wishes on your release. Enjoy your weekend. After a little sleuthing on Amazon my answers are: 4, 3, 5, 1, 2. Thanks, Missy! Any chance you’re going to ACFW this year? Thanks, Brenda… That was my idea in collecting the novellas together. Have a good week. 4, 3, 5, 1, 2. Thank you for the opportunity to win. So nice that’ you’re following my other series too! Thanks for commenting. You’re welcome! So glad you like the Redemption Ranch books! I haven’t read any of these but I think that I should! I hope you enjoy them when you get the chance to dig in! I like reading about the whole person’s life at one time. I love revisiting old characters in books. I have ordered the novellas into one volume, and I’m looking forward to reading them on my upcoming airplane trip overseas! So I am just guessing….1,2,3,4,5…or 5,4,3,2,1 ;) I hope I still qualify as a random winner! Love the books I’ve read of yours…so far! I have all of the books and have read them all. However, it has been awhile, so I only can get the last two right. I am going to pass and let someone else win. That being said, I love all of your books and will continue to purchase and read them as soon a they come out! answers are 4,3,5,1,2 and the winner is…Linda Orr! Linda, send me a message letting me know which of the Sacred Bond books I should gift to you. Thanks, everyone, for participating!